A moiré pattern typically occurs when you scan a printed picture and then view or print out that scan. The above picture is a classic example. This discusses how to use GIMP to remove, or mostly remove from your scan, the typical underlying cause of moiré patterns. The process we are going to use is generically called “descreening” but the exact process we will utilize is Fourier transforms. Commercial printing presses typically only print solid colors – they don’t print shades. So they normally only print CMYK, Cyan Magenta Yellow Black (K). To get other colors it is necessary to mix colors and use shades. For example to get violet you should use cyan @ 55%, magenta @ 80%, yellow @ 55% and black @ 65%. If a printer needs print wants to print violet they will print tiny circles of cyan, magenta, yellow and black. The cyan circles will have a surface area of 55, magenta a surface area of 80, yellow a surface area of 55 and finally black with a surface area of 65. This way there will be more magenta in the picture than yellow for example. Basically the lighter the shade the smaller the dots and the more white paper around them. In the scan to the right you can see that the top of the picture is almost full magenta but the size of the magenta dots varies throughout the scan with smaller dots and more white paper in some areas giving the illusion of a lighter color. 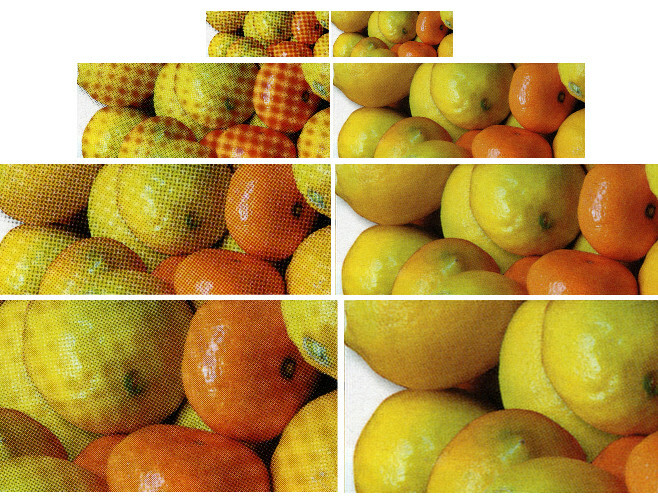 Computer scanner does a precise grid scan of an image combined with the printing process’s grid like technique , which produces moire effects. As I say a lot of printing works like this but not all – laser printers don’t and neither do true photo graphic (chemical) prints. In order to illustrate what can be achieved I scanned a print of some lemons and mandarins. I then made a second copy of the first image, but this time ran a “descreen” through it. Finally I then created a third image file twice as wide as the orginal. In this third image I put the original scan on the left and the descreened version on the right – so side-by-side comparison, no tricks. Fourier transfrom plugin. In my case I was running GIMP in 64bit mode. format – as in what constitutes end of line.